I am so happy to announce my first solo exhibition in Berlin! The show is gonna happen in the sweet venue of Chouquette Cafè, in Friedrichshain, and I’m gonna exhibit a new illustrated story created specially for the event. My work focuses on the narration of empathy into people’s stories through images, that’s why for this occasion I wanted to create a story that could be narrated on the walls of a Berlin café in a natural way, as if it had always been there, a story that surrounds people silently but intensely. Coffee Spoon is a story suspended in the time of one coffee. Has it already happened or is it happening right now? If you are in Berlin come to say hi, drink wine and listen the beautiful music by End of Dimension! I’m pleased to announce our participation in the group exhibition SOFT CITY, at Schloss Biesdorf, Berlin. For this show I collaborated with a great artist, my art sensei, and last but not least my husband, Yukihiro Taguchi. We have been all around the east neighborhood of Berlin, Marzahn-Hellersdorf, drawing and shooting a stop-motion animation video, watching the city through a glass window…got curious? Come to see our short movie and installation at the exhibition! The VERNISSAGE on Friday the 7th. My residency in Ginoza is finished and I’m back to Berlin. 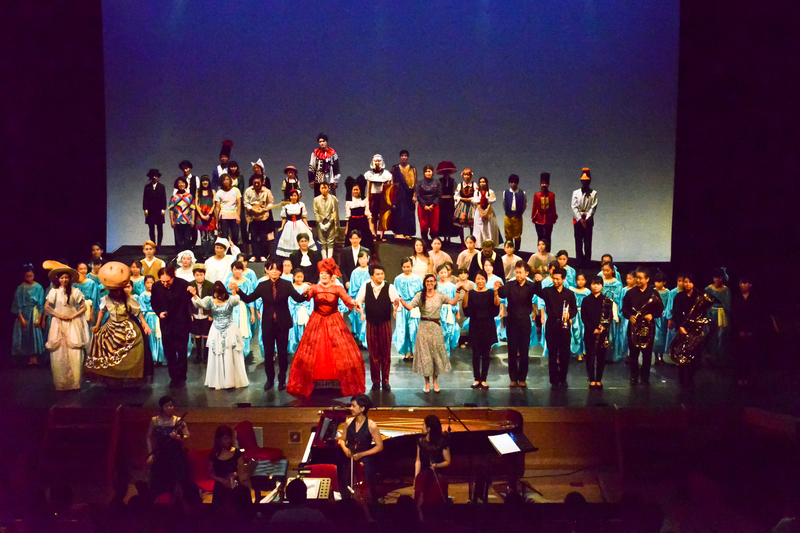 It was such an intense experience and I learned so much, I had the chance to work on a huge theater project ad met great artist and people that I will never forget, I had 2 workshop with the children of the primary school in Ginoza and I’m so thankful because they teached me so much and remember me to keep watching the world with amazed eyes. I also had 2 exhibition, one in Ginoza and one in Naha. It was lot of work, but I’m so glad I had this opportunity and I would do it again 100 times. Thanks so much to all the people of Garaman Hall and Rheinbilder project, you all will have always a special place in my heart. Okinawa see you soon again! I have some big news!!! On the 7th June I will go to Okinawa for about 2 months, that’s my first art residency and I am so happy that will be in the wonderful island in the south-south-south of Japan, as a Sicilian I kind of feel connected to Okinawa…SOUTH ISLANDS POWER!!! 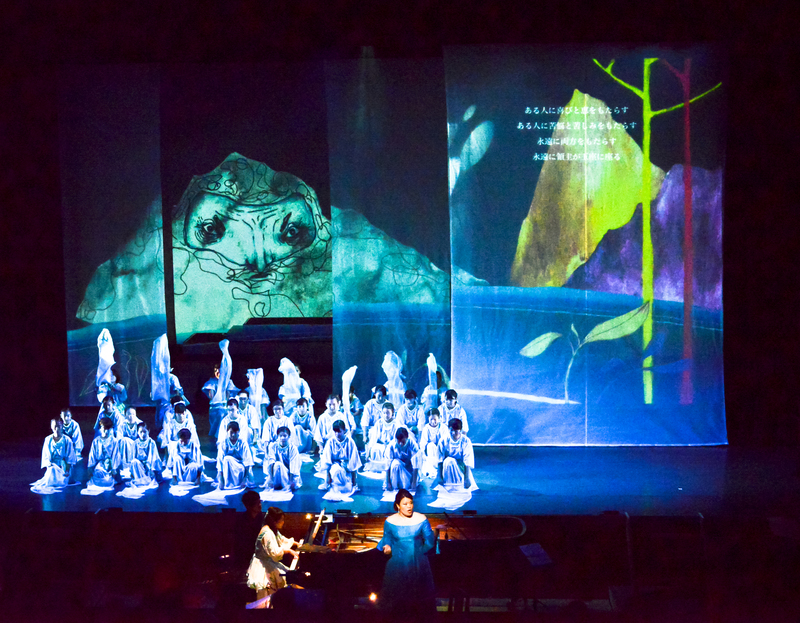 I am honored to take part to a great theater project with my illustrations, and collaborate with great people there to create the scenography. I am so excited and looking forward to being there. The show will be in the end of July in the Garaman Hall of Ginoza. I will post more details about it very soon. And now let’s come back to work! After Bologna, it’s time for working! Two weeks have passed since Bologna Children’s Book fair. It was a great experience and I will definitely do it again next year. I met beautiful people and I had the possibility to talk with many publishers and amazing illustrators, in particular I’m so grateful to Javier Zabala and Giovanni Manna for their advices and constructive feedback, I came back home full of energies and a clearer mind about my work, which are my strong points and what I still have to learn, of course a lot, well I think I will never stop to learn all my life, but I am ready and my motto is “NO HURRY”. And a special thinking goes to my adventure mates, friends and great artists Daniela Spoto and Luca Di Battista, check these guys out, their work is stunning! So now it is not the time for relaxing, I will roll up my sleeves and keep drawing. Bologna Children’s Book Fair – Almost Ready!!! So here we are! I am going to Bologna this year to attend the Children’s Book Fair for my first time!!! I’m so excited and a bit afraid, it is the most important event concerning children book so I wonder if I will be overwhelmed by it. I read so much information around the internet (thanks to all the illustrators who shared their experience) but I think I will never be prepared enough! So there is not so much to do than jump into it! 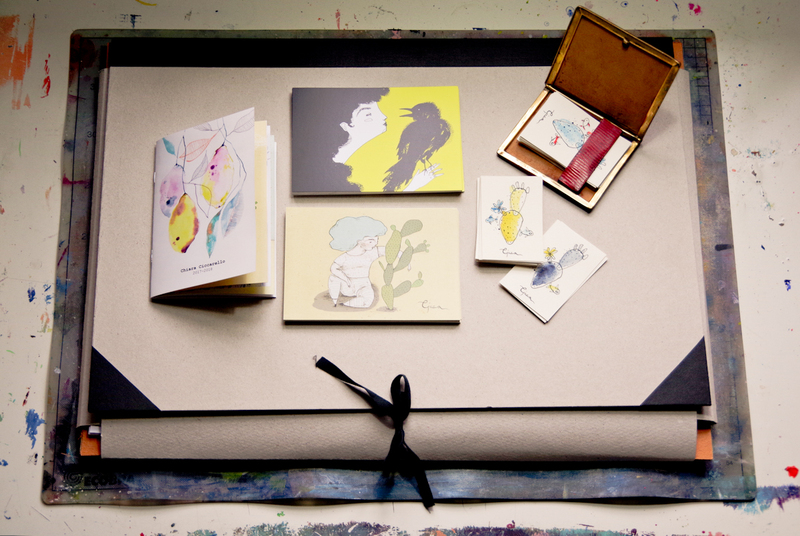 This week I prepared all my promotion material: business cards, post cards, little tiny zines with my works, poster for the Illustrator’s Wall and of course dummy books and my portfolio. I struggled about the portfolio’s format, in the beginning I thought to print my work in A3 format, but in the end I choose a more practical A4, that can easily fit in my backpack. Here a picture of the small format material and a cute vintage sigarettes holder that I use to keep cards, isn’t it adorable? Love is in the air and the sun finally shine on Berlin!!! Special VALENTINE’S SALE is starting today! 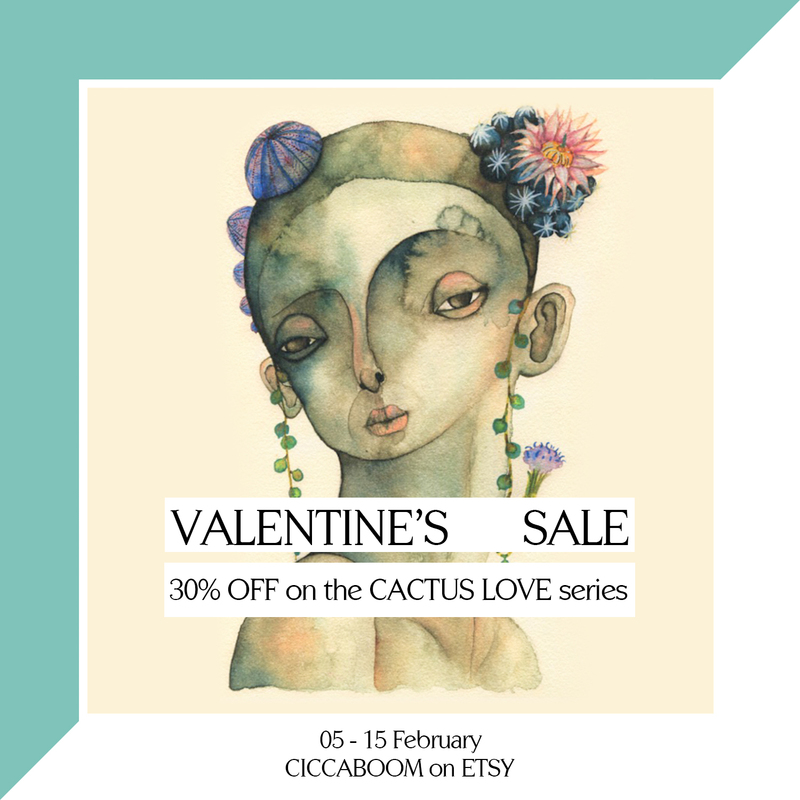 30% OFF on all the CATUS LOVE art prints, just until the 15th February.